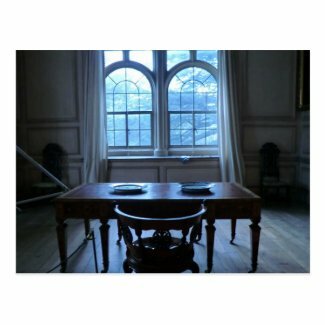 The writing desk at Sudbury Hall has been one of the best received in my whole Zazzle store. The postcard in particular is one of my best-sellers. It appears permanently displayed at the top of the 'popular' listing accordingly. Yet I nearly didn't take the picture. It was a crisp February day, bitterly cold outside. Snow lay on the ground and all the lakes were frozen. Sudbury Hall was bustling with people. It was one of the earliest National Trust homes to open for the season. Most waited until March or April. This was Sudbury's opening day and people patently wanted a day trip after the dreary days of winter. Taking any photograph without people in it was a bit of a trial. But in this case, there was more going on. 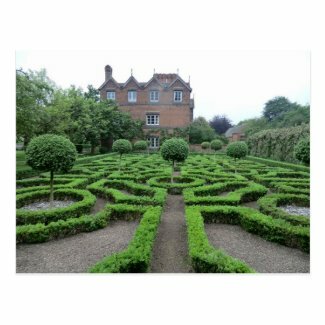 During the winter, Sudbury Hall's management had undertaken some essential repair and maintenance work around the property. This isn't unusual and it's the main reason why so many other homes and gardens remain closed until well into spring. As the tourists milled around, they were occasionally by-passing sealed off areas of work, or scaffolding. The latter was what made me pause before taking the photograph. If you look carefully on the left hand side of the picture above, you will see a corner of the scaffold's A frame. There was no way of avoiding it. This was a tall construction, which reached up into the rafters. A rope ran before the area, creating a make-shift fence. You can see that in the image too. I loved the lighting. 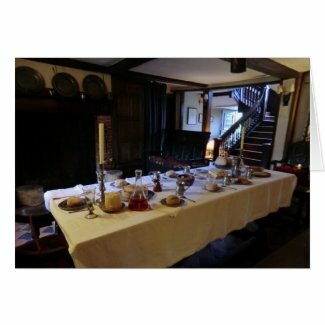 The icy afternoon sunlight was being diffused by mist before it could spill in through the windows of the long gallery. That's what illuminated the writing table so beautifully. I paused. I shifted. I tried to crop out as much of the scaffold as possible. I gave up humming and arrring and just took the picture. After all, this was a digital camera. It wasn't like I was wasting film. Later on, a friend chose that picture amongst the hundreds that I took that day. She loved it, scaffolding, rope barrier and all. She has a good eye. 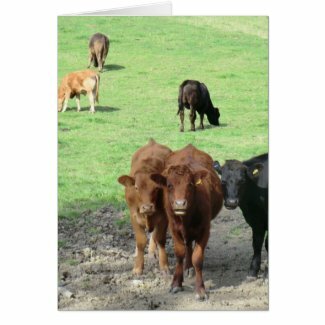 As I said, the cropped version is one of my most popular postcards amongst the clientele of Zazzle. "Where is the Black Country?" The question created much amusement for my American visitors. It was asked by a man in the welcome short film, at the Black Country museum. It was really his response which prompted the laughter. Vehemently stated, in the broadest local tones, he answered his own query, "It's wherever a Black Country man says it is!" True enough as it goes. I once asked around and got as many different answers, as there were people in my survey. But the council maintains its official position. It's any place lying within the metropolitan boroughs of Dudley, Sandwell, Walsall and Wolverhampton. That's cleared that one up then. Until you ask that bloke from Burntwood, who swore that Brownhills was Black Country, always was and always would be, despite sitting firmly within South Staffordshire. The local legend goes that Queen Victoria was once travelling by train (or coach) through the area. She witnessed first hand what an American traveller had already described. 'Black by day, red by night' read his report. The factories, foundries and pits would do that, burning through the night with their furnaces and kilns; vast chimney stacks pumping out dark smoke regardless of the hour. The monarch was not amused. "Close those curtains on this black country," she instructed her lady-in-waiting. Thus the window's view was obscured and she never got to see my gt-gt grandparents waving back at her. It's only recently that the Black Country has been awarded its own flag. The black and red recalls that Victorian description. The chains touch upon the chain-making industries dotted around Dudley and Sandwell especially. The whiteness in the centre is in the shape of a glass kiln chimney. It and the chain are representative of how the Industrial Revolution arrived and hit hard in the Black Country. It's our heritage and our pride. The evening was closing in, as I drove down the lane into Horningsham. Sunlight played through the tall trees lining the road, back-lighting their leaves and casting such beautiful shadows upon the way ahead. It felt almost mystical, like some scene taken from a fairy tale and given form. The long shadows at the end of day will do that. Giving weight to that quest-like feeling was the reason that I was there. I'd been close by and seen the village on the map, then took a detour to visit it. There was history between my family and this place. I wanted to see for myself what they had seen nearly two centuries ago. On June 18th 1815, a baby named Frederick Harrington was baptized in St John the Baptist Church. His father was William Harrington, a coachman, and his mother was named Ann. She was a local girl - born and bred in Horningsham, Wiltshire. Presumably this was the church where her family worshipped. As for William, I don't know where he came from. He died before any census could tell us. Before Frederick was ten years old, the family up and left for the industrial north. They ended up in the wool town of Wolverhampton, where William and Ann Harrington took possession of the Red Cow pub in Dudley Street. Their daughter Sarah was born there in 1823, and died a month later. Another daughter, Caroline, was born in 1825 and she survived. She married a Black Country man named William Beech and had many children. As for Frederick, his marriage to another incomer to Wolverhampton - Mary Pragnall - eventually resulted in me. He is my gt-gt-gt grandfather. So now I stood in the churchyard where my ancestors had most definitely stood nearly two hundred years before. I looked out over the lands of Longleat House, the estate meeting the horizon in a panoramic view. The sunlight still leaving long shadows from gravestones and buildings. You could see for miles up there. All green, fresh and clean, the sort of scenery that you could dream upon for hours. They left this for Wolverhampton, at the dawn of the Industrial Revolution. They swapped those rolling hills and idyllic country for a region which was grimy, noisy and crammed with people. 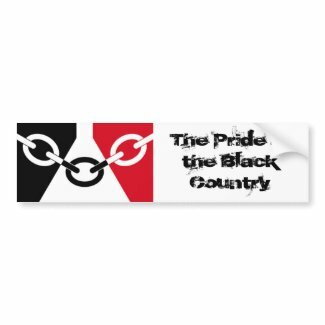 "Black by day, red by night," is how the Black Country was described back then. Slums and tenements were thrown up overnight, the population erupted with the factories, foundries and pits. I couldn't imagine it. I couldn't grasp why a young married couple would take their baby into that, leaving an area so pristine as this. Horningsham blew my mind, because I couldn't fathom the rationale. Until later, that is, when I looked into the history and found famine here back then. They Christened their baby at St John the Baptist Church, then moved north into the grime to ensure that he lived. It was a plan that worked, because I was there to return to the beginning; the gt-gt-gt-gt grandchild of those who took that decision to thrive. I'll raise a toast to that! It's fair to say that I scared myself. But some things you don't even think about until you're there, in the surroundings, imagining it all on a deep soul level. 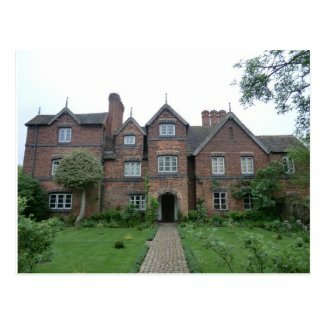 Way back in my distant past, I used to be a tour guide at Old Moseley Hall, near Wolverhampton. As with anyone in that position, I had to be ready to answer any question put to me from a member of the public. While this was usually about the property, the English Civil War, King Charles II or the 17th century in general, there was another constant. "Are there any ghosts at Old Moseley Hall?" Unlike many National Trust properties, there wasn't much in the way of paranormal activity at Old Moseley Hall. Which isn't to say that there weren't stories. First you need the background. After the Battle of Worcester, in 1651, King Charles II had to flee for his life. The Parliamentarians had won and they were after adding his head beside that of his executed father. During the celebrated pursuit which followed, Charles hid at the hall for a short while. 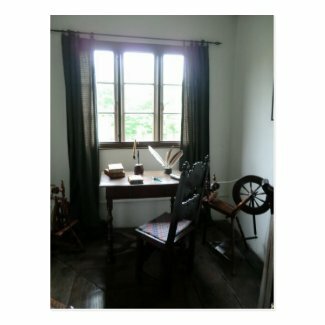 From its windows, he could see his wounded soldiers limping back to Scotland along what used to be the main road through Wolverhampton to the north. It ran right outside. Story number one is that some people, driving late at night down that lane, have sensed those civil war soldiers still passing by. But that's a rare tale and only ever heard from a friend of a friend of a friend. It may have even been inspired by the more famous, and much more attested, similar ghostly occurrences from the battlefields of Culloden or Marston Moor. The second Old Moseley Hall ghost story has much more going for it. That involves the top floor attic area; and it's the place where I really gave myself the chills. Back in the 17th century being Catholic was quite dangerous. The Whitgreave family of Old Moseley Hall were Catholic. This was always the most interesting part of my tour, as I revealed the hidden chapel and told what happened to the pewter candlesticks and vessels for the altar. (Pewter melts in fire. There was always a fire blazing in an antechamber hearth during a service, just in case.) A priest hole was concealed in the floorboards on a lower level. The Whitgreave family knew the risks to life and limb, yet they smuggled in priests and took the sacrament anyway. It's in this area where the presence has been so widely felt. Various visitors shiver there, or feel slightly unwell, and there are those who have seen the Lady herself. A fellow tour guide in period costume? No. There should have been no-one there at all. But nevertheless she's occasionally seen, just standing before the altar, or moving towards the antechamber; always on the top floor. On this particular day, I was living the historian's dream. For the first (and last) time ever on my watch, no tourists had turned up at all. I'd done an earlier tour, and I did one later, but for this slot I was free to just wander around the property completely on my own. There was no-one else there at all. Even the store and cafe were in different buildings. You're waiting for me to say that I saw her, aren't you? I went there. I stood alone in the Catholic Chapel and soaked in the atmosphere. I remembered the Lady and asked aloud if she wanted to chat. No response. I reached out in spirit, seeing if I could somehow sense her. She was not there; or if she was, then she didn't want to speak with the likes of me. After a while, I left my pew and wandered out. But my mind was full of her and her times. I wondered who she was (nobody knows) and what terrible times she must have lived through (if indeed she was as 17th century as reports on her outfit would have it). And my memory threw up the nursery rhyme. So many nursery rhymes are mnemonics. They recall a moment in history or a useful tip, to be passed on in a way even toddlers could remember. Goosey, Goosey, Gander is no exception; and it was very relevant to Old Moseley Hall, with its hidden chapel and recusant worshippers. The geese were the Roundheads. Parliamentarians, often of the same Puritanical bent as Oliver Cromwell, or just hired thugs enjoying the impunity of committing religious persecution. They raided homes which were known, or suspected, to belong to Catholic families. Their searches took them all over, upstairs, downstairs and in my lady's chamber being only part of it. They were looking for the same pewter accoutrements, priests or chapels which Old Moseley Hall so readily kept. As for anyone admitting to being Catholic, or merely getting in the way, then think long and hard on that last line: 'took him by his left leg and threw him down the stairs'. I knew the nursery rhyme and I knew the history. But until I stepped out of that chapel and stood at the top of the staircase at Old Moseley Hall, I didn't know a thing. Suddenly the mental imagery had a real world setting upon which to hook itself. I could see quite clearly the actual terror and the horrific violence that such a sweet and familiar nursery rhyme evoked. So I spoke it. Slowly, half in a whisper, I told the nursery rhyme to the air, as I descended that 17th century staircase. I felt it, heard it, saw it, in my mind's eye, how it could have happened. And by the time I reached the ground floor, the goosebumps were raised on my arms and my hair was standing on end. Had I finally drawn an unseen audience in the Lady ghost? Or simply scared myself? I suspect the latter, but it all seemed so very real. The products illustrating this blog are on the American version of Zazzle. If you wish to see the same in your local Zazzle store (thus neatly side-stepping any customs duty), then just change the root URL accordingly. If you're not sure what that is, then check out the International Zazzle! We found the place by accident, just driving around the Cheshire countryside. But we've been back many times since. It's called Mersey View, in the Bellamonte Park high on the wooded slopes above Frodsham. You can see for miles up there. On a clear day that's as far as Snowdonia in the West and the Pennines in the East. The greatest sight of all is right in front of you. The whole of Merseyside laid out like a map on the landscape. 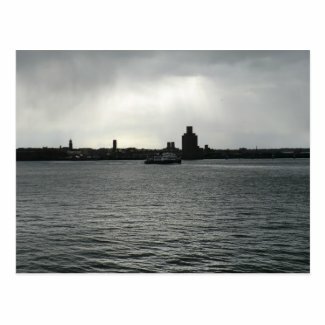 The Rivers Mersey and Weaver both follow their courses, emptying out in Liverpool Bay. The Manchester Ship Canal takes a straighter route off into the north. They all glisten in the sunlight. Then, when the sun begins to set, they reflect back the fiery sky. That picture is zoomed in. 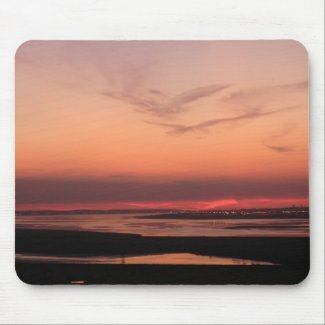 I wanted to capture the sunset over Liverpool. In reality, I was far away and far above, and there were many more towns and cities in my view. Warrington, Runcorn, Ellesmere Port, all those places edging the Mersey north and south; and some which line the Dee. You can watch the ships coming in, bright in daylight, illuminated at night. The smaller ones mere specks, while detail can easily be discerned on those great liners. 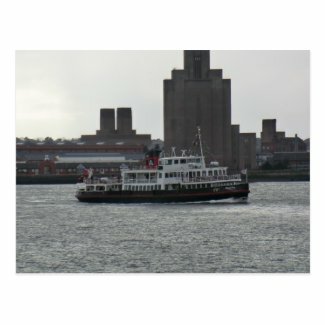 Of course some are more famous than others, like the Ferry 'Cross the Mersey with its own song. But mostly I like to just sit up there dreaming, looking out across the distant hills and mountains, where we saw the beacons fired up for the Queen's Jubilee. I wonder if the Lancastrians and Welsh are sitting on their summits looking back at me. I imagine the history playing out in the miles below. Or I think of nothing and just enjoy the view. My cousin and I are walking down the street, side by side but sixty years apart. I'm not talking about age. We're the same age, give or take nine months (I was apparently such a cute baby that my auntie wanted one; she got him). I'm talking about where our heads were at the time. This was Coventry. He owns a security business (EMK Events Ltd for ALL your crowd control needs); I'm a historian. He was here on business, as his company are providing the crowd safety for a major event in the city. I'm there with a camera to photograph the scenery for Beautiful Britain. "That pub's Victorian." I tell him, as we stroll along a busy street. My head is turning back and forth like I'm watching a tennis match, looking at the buildings on one side of the street and comparing them to the other. He nods, "I wouldn't like to take their business. It's a bit rough down here." He would. He'd work out a strategy to deal with the rough customers. He's always telling me that he wouldn't get involved with such and such a venue because of its troublesome clientele. Then a month or so later, there is no troublesome clientele, because his security officers are ensuring it. "And that's a bit of a dive." "I don't think Hitler agreed with you." I opine, still comparing buildings. On one side of the street, it's all 19th and early 20th century architecture. On the other side, the entire terrace is that bland and frankly awful 1960s concrete block style. But this IS Coventry, ground zero for Moonlight Sonata on November 14th 1940. A beautiful name for the most devastating single night, on a single city, of the Blitz. "He left that whole side standing." "Yeah." said my cousin, in a tone of voice which suggested that was yet another travesty to lay at the door of the Third Reich. "He did." I just love how two people, walking along the same street, have such different perspectives on what they see. It makes for some interesting conversations. Oh No! Richard the Third! To say that it rained that day in Leicester is to totally understate the situation. There are waterfalls less wet than the city streets that August. But this wasn't any old August. It was August 2012, part of the rainiest years since records began in Britain; and also the month when the remains of Richard III were discovered under a car-park in Leicester. We couldn't have known that at the time. I was there meeting friends and desperately trying to keep dry while sight-seeing. The announcement occurred the day afterwards. This was a great shame, because two of our number were historians. Had we known about the trench up Grey Friars, we would certainly have been peering over a fence having a good nosey. Instead we were huddling under an overhang at the Jewry Wall. Roman ruins there, bordering a Saxon/Norman church. All very interesting and, above all, dry. Yet King Richard III wasn't completely ignored that day in Leicester. As my friends escorted me back to my own car-park (sadly lacking in any royal corpses), we crossed Bow Bridge with its big legends. The story goes that Richard rode over it, on his horse, on the way to Bosworth Battlefield. As he passed by an old woman/witch/hag/prophetess warned him that when he returned he would bang his head on the bridge. The Battle of Bosworth duly came and was lost. The stripped naked body of Richard was strung across a horse's back, then brought in procession back to Leicester. There was nothing honourable about this. He was being returned solely so enough people could view his body, that there would be no question that he still lived. Henry Tudor had a kingdom to consolidate and a dynasty to sire. But as the horse and its sad cargo crossed Bow Bridge, Richard's head struck the stonework at the side. The old lady's prophecy (or curse) had come true. That was legend, but there was also an historical rumour attached to this location. After Richard III's body had lay in Leicester for an adequate amount of time, it was taken away. Some said that it was thrown into the River Soar, hence the plaque on the wall (pictured above) which sits alongside Bow Bridge. Others stated that he was retrieved by the Grey Friars and buried in the long-lost friary. It turns out that they were correct. 'Near this spot lie the remains of Richard III the last of the Plantagenets 1485' reads the plaque on Bow Bridge by the River Soar. What they actually meant was that the remains were four minutes walk away, under the car-park of Leicestershire Social Services. The plaque is slightly to the right of the 'B' marking St Augustine Road. The body was actually just off Grey Friars, here marked with an 'A'. 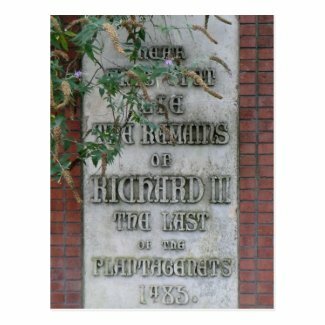 In 2014, Richard will be buried again, this time in the more salubrious environs inside Leicester Cathedral. Which makes us all wonder what will happen to the Bow Bridge plaque. It's now obviously telling a lie to all Leicester tourists, many of whom will be there to visit the soon-to-be-constructed Richard III museum. They will all KNOW that he's in the cathedral, at least after 2014. So we have bets on how long it will take for his plaque to mysteriously disappear. My Leicestershire friend will be keeping his eye out, so we get the alert. The big question is: will the plaque just be flung in the river or be shoved in a make-shift grave under Social Services? The above leads to the American version of Zazzle. If you wish to see the same in your local Zazzle store (thus neatly side-stepping any customs duty), then just change the root URL accordingly. If you're not sure what that is, then check out the International Zazzle!